Dubai: Work has started on another of Dubai’s coming landmark – the One Za’abeel featuring two towers linked by what is to be the “world’s largest cantilever”. Located in the heart of Dubai, it will have overhead connectivity with Zabeel Park. One Za’abeel is due to be completed in Q4-20. “One Za’abeel and its panoramic 210-meter sky concourse – “The Linx” – will in due course re-shape the ever-exciting Dubai skyline,” said Issam Galadari, Director and CEO of Ithra Dubai. The developer is a wholly-owned subsidiary of Investment Corporation of Dubai ICD). The first tower will have of 67 floors and the second tops off at 57. Both rise up from a structure consisting of three levels of podium and seven levels of basement. ‘The Linx’ connects both Towers at a height of around 100 meters. Alec Engineering & Contracting was recently named as the main contractor. Site excavation, preparatory works, shoring and piling are complete, and the construction of a seven-floor basement is underway. 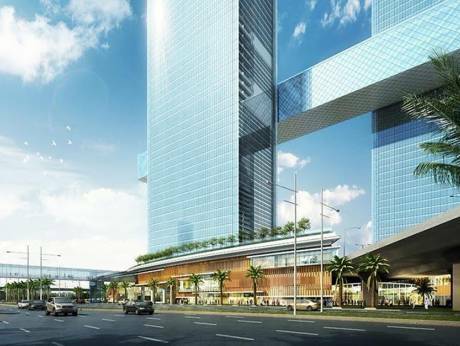 It will eventually have a built-up area of 480,000 square meters, and offer super-premium residences, hotel and serviced apartments, office spaces, and a retail podium known as “The Gallery”. And then there will be the sky concourse. The development – featuring the address #1, Za’abeel – is positioned “between the old and new business districts of Dubai”. Ithra Dubai’s other key development projects include the “Deira Enrichment Project, which will create new residential swellings overlooking the Creek and extend the Deira Souq; and “The Waterfront Market”, itself part of the Deira Enrichment blueprint.